VOX Tonelab EX patches. Settings in videos. 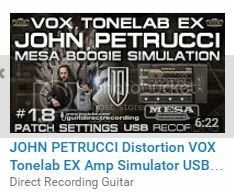 JOHN PETRUCCI Distortion VOX Tonelab EX Amp Simulator USB PATCH [#18]. 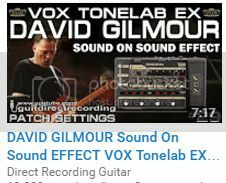 DAVID GILMOUR Sound On Sound EFFECT VOX Tonelab EX [#29].